You may well want to know more about us as individuals. Whom might I be working with, or want to work with? Find out which organisations we work with. We have a network of over sixty Associates with a breadth and depth of experience who we are able to call on in service of our clients’ needs. Probably the best way to understand what it’s like to work with us is to hear from some of our clients. If you’d like to read what clients and participants have to say about working with Practive, please read more here. Here is a short video where the Practive leadership team and some of our clients talk about our work. For a summary of some of the skills, qualities and attributes that our clients report to us that we bring, please read more here. We believe that all human beings are capable of extraordinary things and that we are all capable of change – it is never too late to learn something new. We also know that any change requires work and great personal commitment. Our experience tells us that the most successful organisations are those that are committed to learning and development for all their staff. The skills we help to develop are often referred to as “soft skills”. We think these skills are vital and complex and worth taking the time to develop. Any change in an organisation – in structure, process and/or culture requires behavioural change from individuals. In our view personal development is not a soft option but a must-have for any successful, growing business or organisation. Our view is that self-development is not only about the responsibility we have for ourselves but also about the responsibility we have to our communities. The skills we work with are life skills. They can benefit us not only at work but also in our families and our communities. 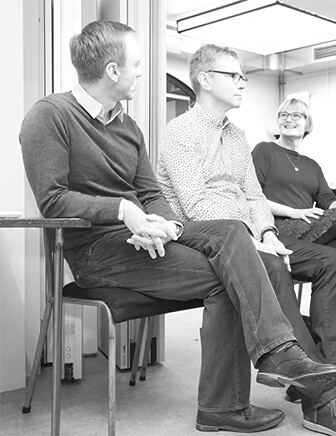 Practive was founded in 2002, and is led by Joel Greig, Adam Woodroffe, Philippa Williams and Jamie Ripman. PRACTIVE: (A) Devoted to practice or action - 1610. We are a leadership development consultancy specialising in the practice of leadership. Our aim is to help leaders at all levels in organisations to develop their impact, effectiveness and influence and by doing this, to help teams, organisations and systems to improve their performance. At the heart of all of our interventions is a passion for understanding and developing in ourselves and others the knowledge, strategies, behaviours and mindset of leadership that enables the shift from concepts and theories into practice and action. The question that interests us is “What does effective leadership look like, sound like and feel like?” We recognise there is sometimes a gap between the impact that we want to have on others and how we are perceived. In order to be more effective or achieve a better outcome we may need to change the way we behave. We have a reputation for giving clear, insightful and constructive feedback as well as providing the opportunities for our clients to practise and develop their skills. In this way we can help our clients to develop the appropriate knowledge, strategies, behaviours, skills and mindset in order to have the effect on others that they want. Practive works with a network of over sixty associates from a wide range of disciplines and backgrounds to enable us to tailor our interventions to the needs of our clients. Our vision is to attract the best freelance facilitators, coaches, psychologists, business roleplayers, writers and other specialists in leadership and organisational development to work with us to create innovative, energising and highly effective interventions and training programmes. Since 2002 we have worked with a wide range of clients in the private, public and charity sectors.